If you are a gamer, you may be aware that buying games online is wallet-friendly, than buying games from offline brick and mortar stores. But you can actually save more money, by finding the best deals for the games you want to buy online. How to find the best game deals online? Here is how. Whether you want to buy games like Assassin’s Creed, or Batman Arkham Kinght, Elder Scrolls V Skyrim or GTA V, it doesn’t matter. This guide is here to help you out. 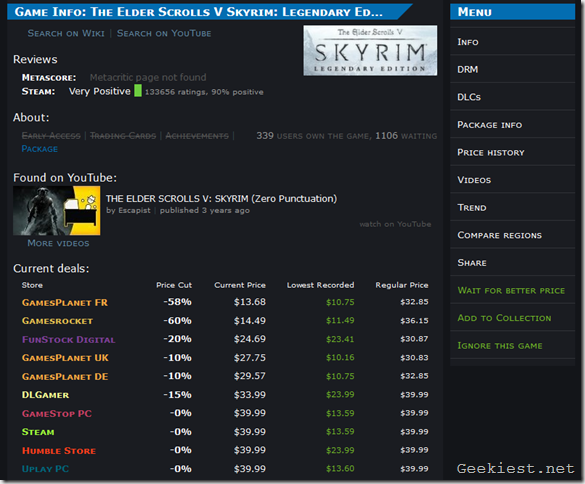 We have prepared a list of websites you can buy games from, and also some which you can use to find the latest deals. This sub reddit is a treasure trove, and is updated very frequently throughout the day to help gamers find some great deals. Navigating this sub can be a hassle, but the search function is of great help. Feedback is a huge plus, and you can drop a comment to ask other gamers if a game is worth the price, or even worth buying. Not all deals are posted, so you may miss a few. As the name suggests, the website lets you search for the game you want and displays some incredibly useful search results. It displays a list of online stores, where the game is available from, its current price and percentage of discount offered, the price history of the game which lists the lowest price the game was sold for on each store, and the game’s regular price. It also offers a waitlist (requires signup), to which you can add games you wish to buy, and also select the minimum price drop percentage for which you wish to be notified. Always add games you wish to buy to your wishlist, if the website supports it. This will notifiy you when the game goes on sale. Always check the system requirements before buying a game. Check the DRM for the game which you want to buy. Some games are DRM Free, while some requires a client like Steam or UPlay. When buying games with DRM (like Steam), check if the game is available in your region. Geo-restricted games cannot be downloaded on Steam. What are the best websites to buy games from? This is a web store where you can buy game bundles from. Game bundles sold at Humble Bundle requires the user to “pay what you want”, and get the games. Normally, bundles are split into two sections. The “pay what you want” section usually gives a few games for any amount of your choice, but Steam Keys require you to pay a minimum of $1. The other section is called “Beat The Average”, the price of which is decided by the average amount for which the bundle is being bought for by other members. The best part is it also sells Android game bundles, and sometimes it includes PC versions of the games as well. Gives away free games, but this happens very rarely. Game bundles can be gifted to anyone. Their library isn’t big. And the bundles vary greatly. So it may not be ideal to wait for your favorite game to be included in a Weekly Bundle. Android Games are rarely updated. This may also be the case for some PC games. Sells DRM Free games only. Gives away free games, but this rarely happens. Sells legitimate Steam Keys as well as other download options. You will find their prices stunning, and discounted sales are held throughout out the year. And their representatives even post about deals at Reddit Game Deals, and also help to resolve issues. 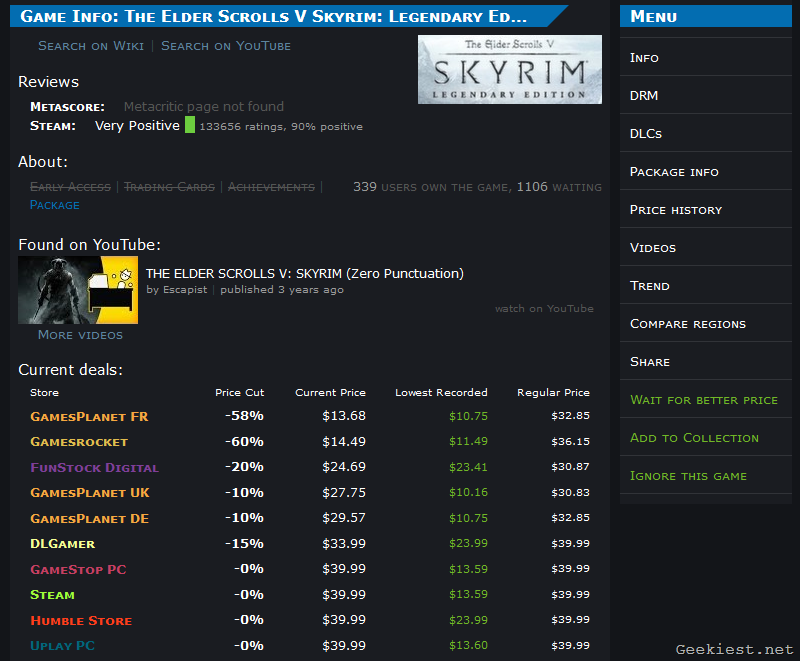 The website has a superb collection of games, and the discounts offered are quite unbelievable. Creating an account on Gamesplanet UK, or France or Germany, will let you login to the other two websites using the same credentials, and also buy games from either of the three websites. Can set up wishlist for games, and set up email notifications for a custom amount. An email will be sent when the game drops to your required amount. Sometimes, purchases may end up in review, but contacting their support team through email, can help solve the issue almost immediately. For e.g: When a PayPal id is used to purchase a game, and the registered PayPal email differs from the email used to register an account at Gamesplanet, the purchase is held in review to prevent fraud. This is a Brazilian website which is also available in English and Spanish. Game keys sold on Nuuvem include Steam, UPlay, Direct Downloads and more. You will find several discounted games at Nuuvem, but some are hidden for non-Brazilian users. So you should use a VPN like Hola Chrome Extension, and visit the website to find more deals. Note: Doing so will change the website’s language to Portugese, but its not difficult to navigate. Currency is displayed in Brazilian Reals. Nuuvem is currently holding a Winter Marathon sale, which includes top selling games. This is another game bundle store, and holds frequent sales as well. You will find quite a few games at their store, but not many are from big companies, as the website focuses on selling games made by Indie Developers. The library is not big. This website is an unsung hero amongst online game sellers. Though its library is not huge, it does offer some quality games on sale. Some hidden games are sold here for cheap. Navigating the website can be a pain. But Search is your best friend here. Some game companies sell their titles exclusively on their own store, for e.g. : Blizzard sells Starcraft 2, Diablo 3 and its expansions on its on store, and sales on such websites are quite rare. There is no other option than to wait for a discount to happen.